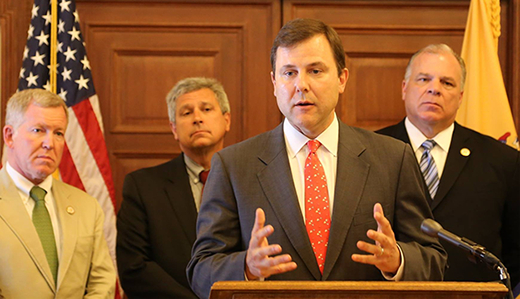 Senator Christopher “Kip” Bateman, Senate Republican Leader Tom Kean, Senator Bob Gordon and Senate President Steve Sweeney announced they have reached an agreement with the Christie Administration to end the state’s ‘Return Home’ policy as it currently exists. Under new legislation sponsored by the senators and agreed upon by the administration, the state Division of Developmental Disabilities would be prohibited from transferring an individual with a developmental disability currently residing out-of-state to a placement in New Jersey if the individual or their guardian objects in writing. Due to New Jersey’s inability to meet the needs of certain individuals with developmental disabilities, several hundred residents have been placed in out-of-state facilities over the course of decades in order to receive the services they required. In 2009, the DDD began the “Return Home New Jersey” initiative, which was designed to transfer individuals to community-based placements in New Jersey. The DDD stated they were pursuing federal matching funds that are not available for many out-of-state clients. More than 300 residents remain out of state. Senator Gordon was the sponsor of legislation to impose a moratorium on the state’s ‘Return Home’ policy. The bill passed both houses and was vetoed by the governor; the override attempt held last month fell short by one vote. The new bill will protect individuals with developmental disabilities in out-of-state placements from being transferred back to New Jersey without their or their guardian’s approval. The legislation provides very narrow exceptions. It would allow the transfer of an individual to a New Jersey placement: if the facility, client or guardian does not comply with certain state or federal requirements, including those related to the health and safety of the client; or if an individual changes providers after the effective date of the law. The provision concerning a change in provider would not apply, however, if the change is due to corporate or other organizational restructuring, or if the DDD is unable to provide the individual with equivalent necessary services and supports in state. The legislation will be introduced and is expected to be considered by the full Senate Thursday. The Christie Administration agreed to implement the change administratively immediately.